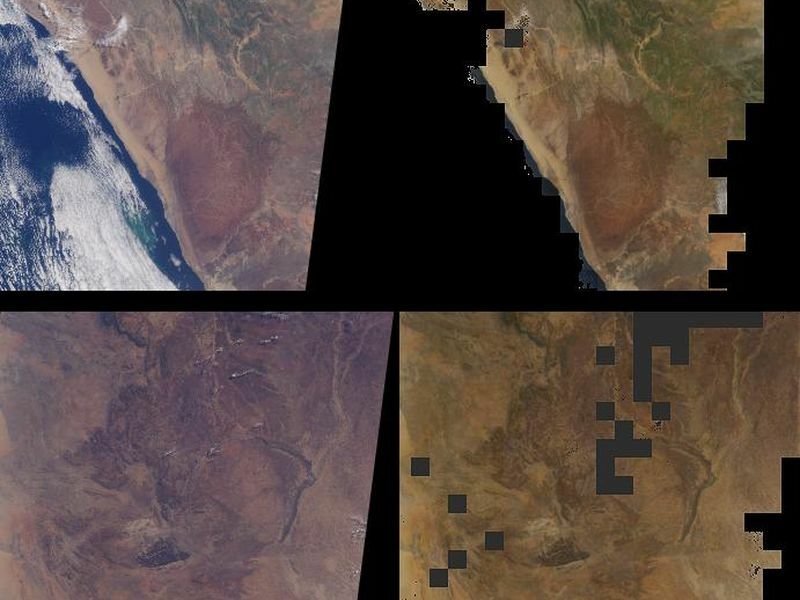 Brightness variations in the terrain along a portion of southwestern Africa are displayed in these views from the Multi-angle Imaging SpectroRadiometer (MISR). The panels portray an area that includes Namibia's Skeleton Coast and Etosha National Park as well as Angola's Cuando Cubango. The top panels were acquired on March 6, 2001, during the region's wet season, and the bottom panels were acquired on September 1, 2002, during the dry season. Corresponding changes in the abundance of vegetation are apparent. 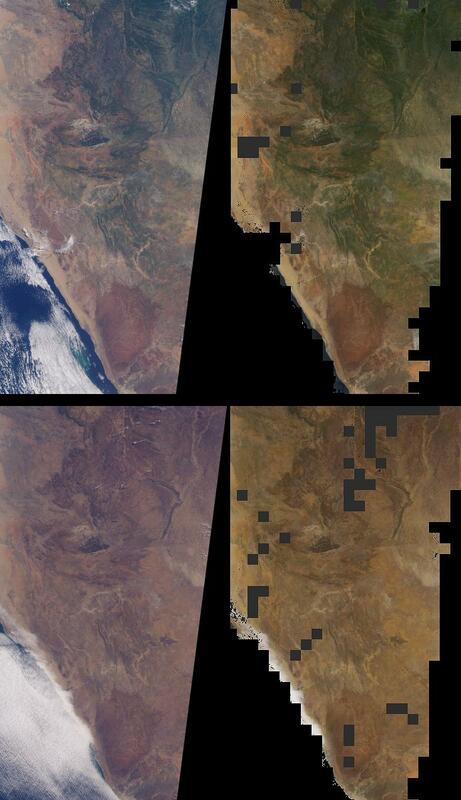 The images on the left are natural color (red, green, blue) images from MISR's vertical-viewing (nadir) camera. The images on the right represent one of MISR's derived surface products. The radiance (light intensity) in each pixel of the so-called "top-of-atmosphere" images on the left includes light that is reflected by the Earth's surface in addition to light that is transmitted and reflected by the atmosphere. The amount of radiation reflected by the surface into all upward directions, as opposed to any single direction, is important when studying Earth's energy budget. A quantity called the surface "directional hemispherical reflectance" (DHR), sometimes called the "black-sky albedo," captures this information, and is depicted in the images on the right. MISR's multi-angle views lead to more accurate estimates of the amount of radiation reflected into all directions than can be obtained as a result of looking at a single (e.g., vertically downward) view angle. Furthermore, to generate this surface product accurately, it is necessary to compensate for the effects of the intervening atmosphere, and MISR provides the ability to characterize and account for scattering of light by airborne particulates (aerosols). The DHR is called a hemispherical reflectance because it measures the amount of radiation reflected into all upward directions, and which therefore traverses an imaginary hemisphere situated above each surface point. The "directional" part of the name describes the illumination geometry, and indicates that in the absence of an intervening atmosphere, light from the Sun illuminates the surface from a single direction (that is, there is no diffuse skylight, hence the "black-sky" terminology). 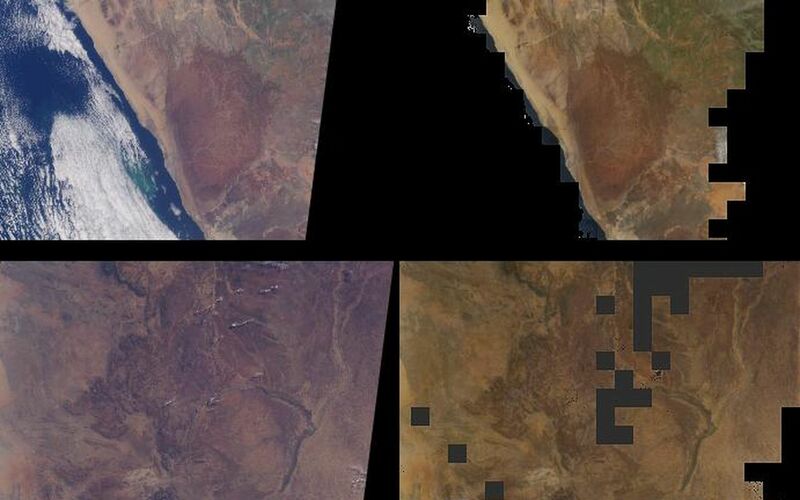 The DHR is retrieved over land surfaces in each of MISR's four wavelength bands, and the images on the right are red, green, blue spectral composites. Regions where DHR could not be derived, either due to an inability to retrieve the necessary atmospheric characteristics or due to the presence of clouds, are shown in dark gray. The Multi-angle Imaging SpectroRadiometer observes the daylit Earth continuously and every 9 days views the entire globe between 82 degrees north and 82 degrees south latitude. These data products were generated from a portion of the imagery acquired during Terra orbits 6466 and 14388. The panels cover an area of about 380 kilometers x 760 kilometers, and utilize data from blocks 102 to 107 within World Reference System-2 path 181.